All local marine waters are open to shellfish harvesting. West Coast Resorts has an application for a tidal sports fishing camp located four kilometres to the north. Little other land-based activity occurs in the area though forest harvesting takes place on some adjacent islands. Commercial and recreational fishers use the waters surrounding the ecological reserve. Biodiversity and Fish and Wildlife Recreation and Allocation branches of the Ministry of Water, Land and Air Protection and the Canadian Wildlife Service have an interest in the rare breeding bird populations in the ecological reserve. Previous planning has been restricted to the preparation of an annual management plan detailing current year activities. The provincial government established Dewdney and Glide Islands Ecological Reserve (E.R #25) on May 4, 1971 under the authority of the Ecological Reserve Act and Order-in-Council #1587/71. The Protected Areas of British Columbia Act provided legislated status to the ecological reserve boundaries on June 12, 2000. The ecological reserve is located in the southernmost part of the Estevan Group of islands within southern Hecate Strait, 150 kilometres southeast of Sandspit, 135 kilometres southwest of Kitimat and 175 kilometres south of Prince Rupert. The ecological reserve protects 3,845 hectares of land, including all of the islands, islets, rocks and skerries within the area delineated on Map 1. Marine waters and foreshore are not included in the ecological reserve. 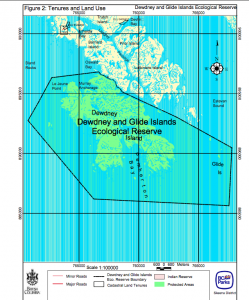 The majority of the ecological reserve is represented by Dewdney Island, with the remainder being smaller land masses, including 10 hectares by Glide Islands, 4 kilometres to the east of Dewdney Island. The ecological reserve lies within Tsimshian asserted traditional territory, Kitkatla First Nation. This ecological reserve represents the extensive bog and fen ecosystems found on outer islands of the north coast. These wetlands have unique communities of mosses, and are known for their high diversity of plant species including a number of rare plant species. The ecological reserve also contains nesting habitat for several birds that have a restricted breeding range within the province, including the sandhill crane and the Cassin’s auklet which nests on Glide Islands. Additionally, an isolated beaver population lives on Dewdney Island. The ecological reserve protects a representative area of the Hecate Lowland Ecosection while also protecting provincially important rare bird habitats and plant species. The remote location of the ecological reserve limits educational opportunities. Hakai Conservation Study Area, which is also on the outer coast, provides opportunities for recreational activities such as kayaking and boating. Other protected areas on the north and central coast that complement existing protected areas are recommended in the recently completed Kalum Land and Resource Management Plan (LRMP) and in the ongoing Central Coast LRMP, and further sites will be identified through the North Coast LRMP that is getting underway. Other ecological reserves on the outer north coast are: Byers/,Conroy/Harvey/Sinnett Islands Ecological Reserve, and Moore/ McKenny/Whitmore Islands Ecological Reserve. These two ecological reserves are noted for their exceptional seabird and marine mammal populations, and in contrast to Dewdney and Glide Ecological Reserve, only contain small areas of land. Protects a small area of the moderately represented Hecate Lowlands Ecosection. Currently 4% of this ecosection is included in the protected areas system. 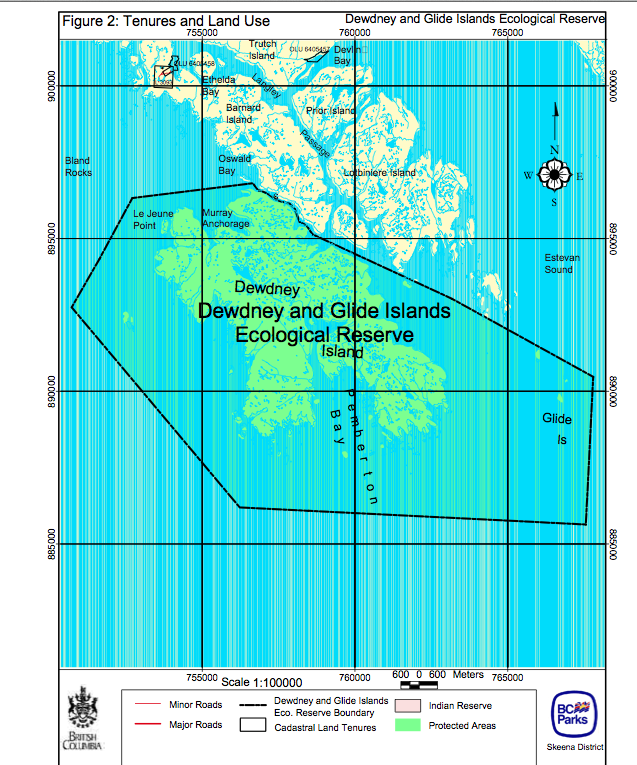 Dewdney and Glide Islands Ecological Reserve is the second greatest contributor (6% of overall representation) to the representation of this ecosection behind Hakai Conservation Study Area (85%). Protects 3,845 hectares of the CWHvh2 subzone (Coastal Western Hemlock very wet Hypermaritime subzone, Central variant). This variant is well represented in the protected areas system (9.96%). Dewdney and Glide Islands Ecological Reserve provides the third greatest extent of representation (2.5%) in the provincial protected areas system behind Hakai Conservation Study Area (31%) and Vladimir J. Krajina Ecological Reserve (4%). South Moresby National Park Reserve provides the most representation of the CWHvh2 subzone. Protects extensive bog and fen wetland ecosystems representative of the outer islands of the north coast. Contains the following rare plant communities that are Blue-listed (S3) with the Conservation DataCentre, CWHvh2/16 Sitka spruce / reedgrass (Picea sitchensis / Calamagrostis nutkaensis), and CWHvh2/13 Western redcedar/Sitka spruce – Skunk cabbage (Thuja plicata/Picea sitchensis – Lysichitum americanum ). Protects a special forest and wetlands complex on Dewdney Island where the forest grows in a fringe around the circumference of the island surrounding an interior wetland environment. Holds potential for research on breeding populations of several rare bird and plant species and on an isolated beaver population. Contains potential for research on the functioning of outer coast wetland ecosystems, including hydrology, wetland development and plant community dynamics. Offers limited opportunities for public education because of the ecological reserve’s remote location and a public access closure that stipulates a permit is required for all access (OIC # 1920/1977). • The Environmental Stewardship Division has not identified cultural values in the ecological reserve. First Nations traditional use studies may provide relevant information. One of the few protected areas conserving an example of the outer islands of the north coast of British Columbia. The ecological reserve’s coastal wetland ecosystems and associated rare plant communities are a special feature. • The Environmental Stewardship Division issued a permit to the Canadian Coast Guard to operate navigation lights on Jacinto Island. West Coast Resorts has an application for a tidal sports fishing camp located four kilometres to thenorth. Little other land-based activity occurs in the area though forest harvesting takes place on some adjacentislands.